Edmonton is home to over 230 stormwater management facilities (which include stormwater lakes, dry ponds and more), some of which have been in service for 30 years or longer. To better maintain and upgrade stormwater lakes, the City undertook a pilot project to develop a condition assessment program. 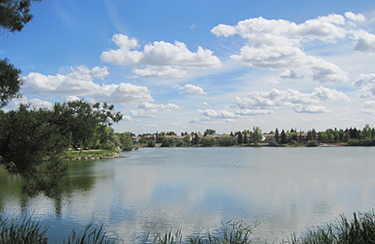 Beaumaris Lake was the first stormwater facility to be selected to have the assessment completed. Beaumaris was selected as a benchmark due to its complexity and age. The facility has many non-drainage parts which are in significant need of repair because of their physical condition and the potential to be public safety hazards. Program staff will use Beaumaris Lake as a pilot model to determine how to revitalize stormwater lakes. The Beaumaris Lake Condition Assessment project took place from October 2015 - October 2016. This condition assessment included review of the drainage system and on-site assessment of the infrastructure. The strategy phase of the project is complete, with results of the condition assessment indicating that although the drainage system is functioning well, some of the landscaping and amenities surrounding the lake are in need of upgrading. A public information session was held in the spring of 2016 to better understand the current use of the amenities (view the display boards from the meeting). This information will be used to guide future phases of the project. Each step will include public engagement. Existing operation and maintenance activities continue, including additional monitoring of the lake, minor repairs and safety inspections. Additional temporary chain-link fence at west promenade area to direct pedestrians to safer sections of concrete stairs that are in better condition. The Utilities Infrastructure branch is working on a different project that is also in the Beaumaris Lake area. Construction started in April 2016 on a tunneling project along 153 Avenue from Castledowns Road to 88 Street, with an area adjacent to Beaumaris Lake set up as the main work site. This work is expected to last for about four-and-a-half years. View the public engagement calendar and Drainage public consultation pages for any upcoming public meeting dates.